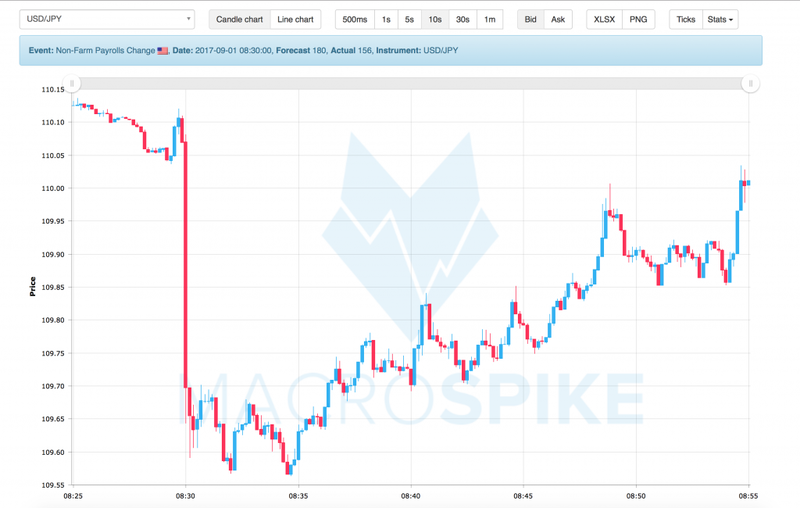 MacroCharts is MacroSpike’s interactive Chart application. It provides you with detailed historical and interactive charts for every event. Our Chart Platform provides you with historical charts for over 40 different instruments. After every event, you can access them via the calendar or via the Trade Plans. Additionally, you can access our Database of more than 45 000 charts. Subscribers of the MacroTrader can generate tick files of the instruments they are trading. Any of the MacroTrader’s EAs can record ticks. 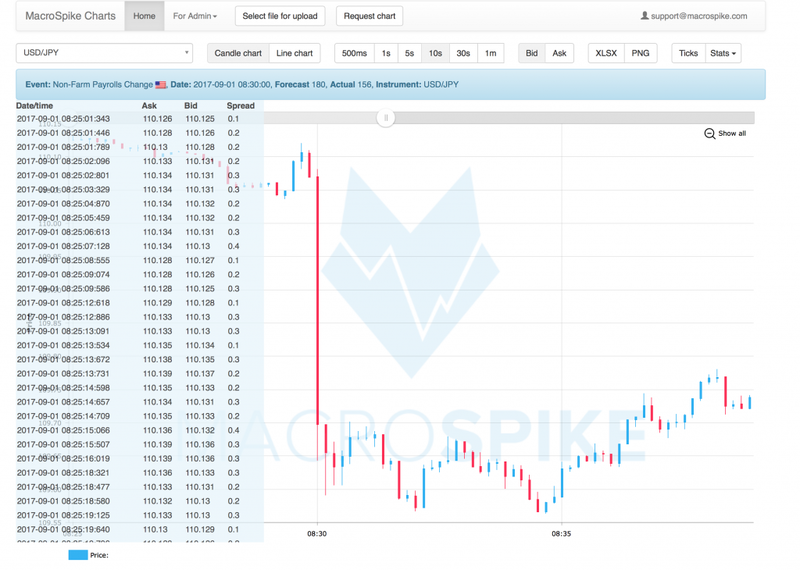 This tick file can be uploaded to the MacroCharts app to create custom charts. 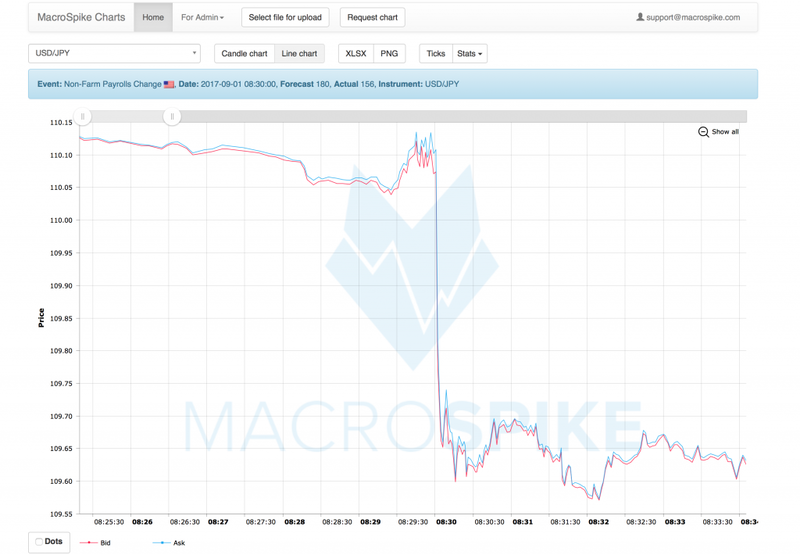 Simply drag and drop the tick files onto MacroCharts, or click on the ‘Select File for Upload’ Button. The default folder for tick files is C:\Data. The main window displays the chart. The chart is interactive and you can zoom in and out using the mouse wheel. Use ‘Show all’ to reset the chart again. You can choose between candlesticks and line charts to display the data. If you choose candles, you can change candle sizes and switch between the bid and ask price. We offer 500ms, 1s, 5s, 10s and 1 min candles. If you choose the line chart, you can see the bid and ask lined up together. On the bottom right, you can disable either the bid or the ask. Or enable price tick dots for the chart. This will highlight every time a tick was received by the MetaTrader. By pressing the tick button, you can open a separate window. This displays a table with all the bid and ask price ticks, their timestamps and spread values. The Stat-Box displays additional information about your chart. These statistics can be particularly helpful when you are using a user-generated chart. The statistics with a * indicate that upon hovering over the row, the tick will be highlighted on the chart.